As I write this, we are sitting around a campfire in 100 Mile House, British Columbia. It’s likely that internet will not be an available option for the next few days, so in order to keep the details crisp and juicy I will write in a Word document and the cut-and-paste the entries into the blog when we re-enter civilization. This morning seems like such a distant memory, but it was only 12 hours ago that Dan and I said farewell to Carol, Matt, and Marley and bellied up to a bar…a breakfast bar that is…to have some fresh lox with our bagels. When in Rome….! 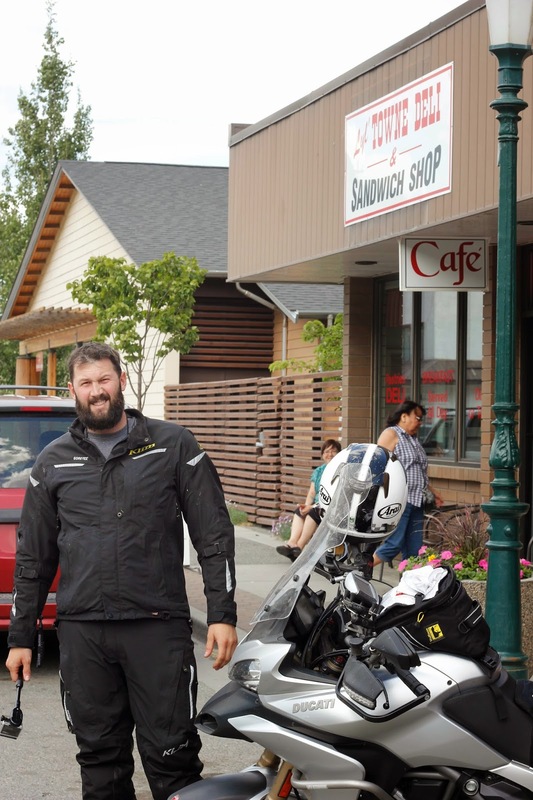 After filling our bellies, we jumped on the bike, met up with Rick, and hit the road! Today was by far the most amazing day of riding yet! We rode for a little while on I-5 before exiting onto the scenic highways for the remainder of the day. It took less than an hour of riding before we laid eyes on a soaring bald eagle…REALLY? How much more Americana does it get? 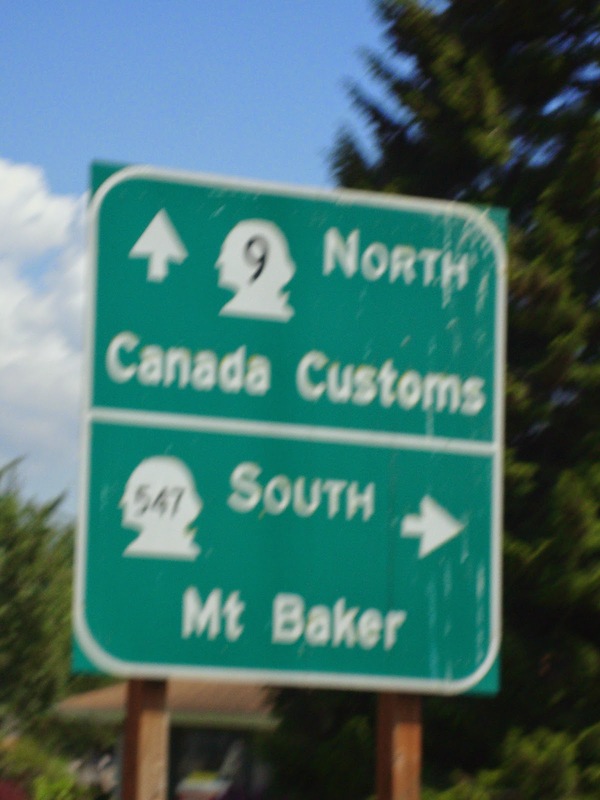 We reached the Canadian border and easily crossed through customs. When asked if we would be leaving anything behind, Dan replied that he would be leaving me behind if I gave him trouble….the customs officer didn’t find this amusing. It’s OK, honey, I think you’re funny! No, you are not drunk or in need of glasses, I am trying to take some of these photos with a point-and-shoot that I have on a lanyard around my neck while moving at 75 miles and hour...or is that 100 kilometers an hour? After crossing the border into Canada we were greeted with the most beautiful scenery we could have dreamed of! The photos will not do it justice, but I sure did try to capture some of the extreme awesomeness. We were treated to lush hills and mountains, some snow capped, countless waterfalls, raging rivers lining the roadways, and the occasional deer, rapture, and even a mountain goat. We made a stop in Lytton for lunch and had a modest but filling lunch in the only café in town. 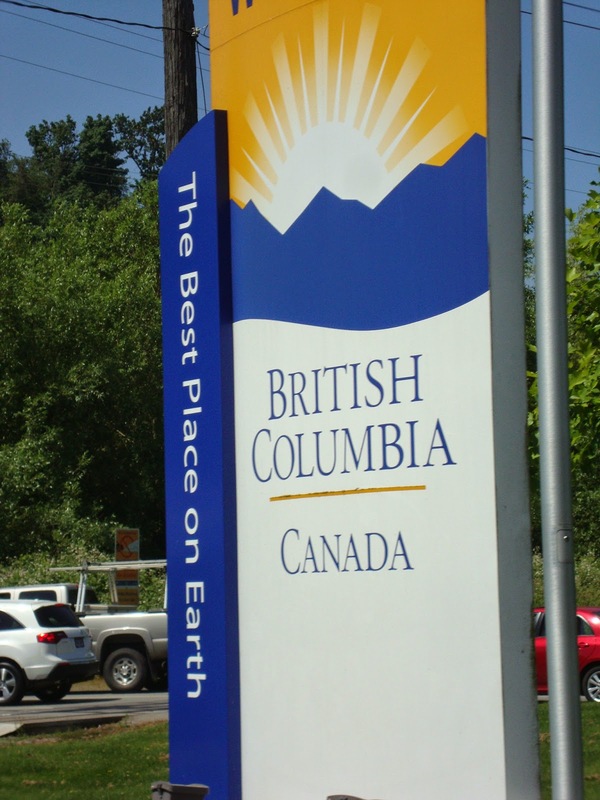 We then jumped on the bikes again and enjoyed more gorgeous scenery and winding roads until we entered 100 Mile House… We stocked up on some groceries and headed for the campsite. While Rick and I set up the tents and get dinner ready, Dan went out in search of firewood. He struck out at an RV campground that only sells their precious firewood to customers, but scored 5 logs of firewood from a gas station attendant’s private stash for $2.00. Score! With a nice fire roaring, we cooked up our beanie-weenies and canned chili, poured some red wine in our camping mugs, and kicked back to enjoy the view of the lake at our campsite. The sun is expected to set here tonight at 10:30pm…amazing! Soon we will be climbing into our tents to cozy up in our sleeping bag laid upon our fancy new sleeping pads, and YES, pillows, so that we can wake up and get our day started early tomorrow. Men, make me a fire! 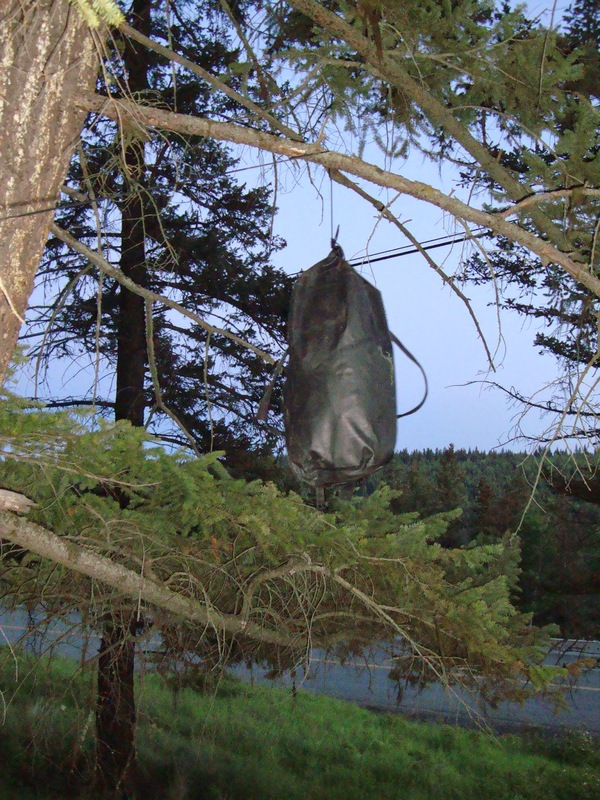 Good ole' bear bag hanging in the tree! 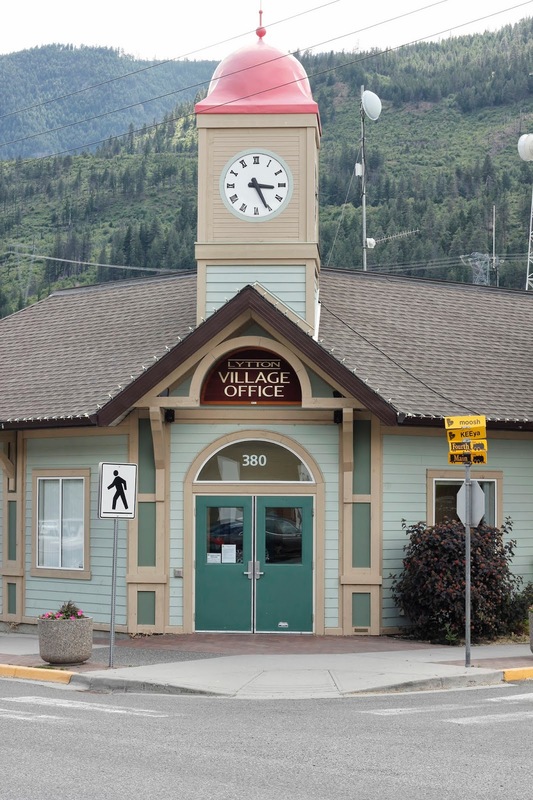 I am posting this from Smithers, BC where we arrived this evening after 430 miles of riding! We decided to grab a hotel tonight, and while there is wifi, it is SLOW! So I will post the remaining blog posts when we have a better signal! Smooches!